Paolo Rizzetto is a Comboni missionary working in South Sudan and is among those in this war-torn country who have “accepted the difficult privilege of caring for others, those in need, those who are vulnerable”. 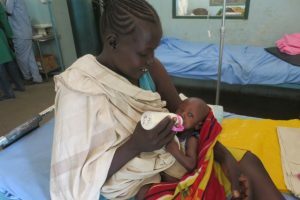 He makes a balance of the work he has done with his team in a mission hospital throughout this year and finds many blessings and graces, despite the difficult situation of South Sudan. Dear friends, greetings and a smile from Mapuordit, South Sudan. Trying to collect the Graces and the Blessings of this year I found this picture. I did not take it myself. Toward the end of this year, in addition to the hospital statistics, I wanted to collect something that would help me remember that, beyond all our concerns, what we celebrate at Christmas is this: a child God who entrusts himself to our humanity; our humanity that receives this gift with amazement and happiness. It seems to me that we can see this mystery in the exchange of looks between this child and his mother. This year was a year of civil war for many parts of South Sudan. With the Head of Opposition in exile and after the re-opening of hostilities in the capital Juba, last July, those who are called “rebels” have certainly suffered a military defeat but the fighting has not ceased, in the Northeast and, instead, other pockets of discontent, against the iron fist of the Government, exploded, extending the conflict into other regions of the Country, previously unrelated to the war. The exodus of people who have crossed the border to escape from this situation is impressive. We speak of thousands of people, every day. So far, as we can estimate, more than a million South Sudanese were welcomed as refugees in Uganda, Kenya, Ethiopia and – incredible but true – even in Northern Sudan, which for almost fifty years was the enemy against whom the liberation movement of South Sudan fought to achieve independence, realized at a high costs, in terms of human lives, in 2011. To make some estimates, it means that about 10% of the population has escaped from the civil war in last two years! The peace talks between the two parties, even under the eyes of the international community, have never arrived to a solution and indeed, many times, almost immediately after the signing of a new agreement to cease hostilities, one of the parties has broken the pacts, and always, systematically, accused the other of having started first, thus declaring that they had simply organized to defend themselves. It is really true that, in war, the first victim is the truth. I want to tell you, right away that, our area, surprisingly, is not a theatre of hostility, although, obviously, we are apprehensive about what can happen, since the situation can change at any time. I should not make comparisons of this kind but, compared to other areas of the country, the situation here has always remained quiet and the hospital’s activities have continued on a regular basis. Of course, the local population is affected by the situation of general insecurity. The rate of inflation is constantly increasing: at the beginning of the year the value of the South-Sudanese pound in the local market was 83 for a dollar, while now it is already 180. The situation is very volatile and the rate of inflation changes, depending on where you live, whether in the city or in isolated areas. Simply, this means that the ability to buy common goods decreases every month and unless we commit to make constant adjustments, for example, to the salary of employees, these are not able, to buy the same amount of assets, compared to the previous period. This does not depend only on the financial situation of general bankruptcy, but also on physical and geographical factors, such as the rainy season just concluded, that, if on one hand it allows people to cultivate, on the other it makes the transport of goods from abroad inland, very difficult, with a consequent increase in prices to the market. Now these are the thorns and the weeds (and perhaps the list could be longer). What does it work? What happened to be able to give thanks again to the God of Life? At the time of writing I see there were 32.314 outpatient contacts, and 3.962 patients were admitted. 3.713 attended antenatal clinic and 368 decided to give birth in the hospital. 17.902 vaccinations were carried out in the territory and inside the hospital for children born and for pregnant women. 403 surgeries were performed, including 10 caesarean sections. Malaria remains the most prevalent disease and there is still much to be done in the field of prevention and acceptance of the required therapy for the HIV / AIDS epidemic. Even if the numbers will increase, slightly, with the end of the year (the statistics are updated at November), maybe we will not reach the milestones of 2.016 but the result is, however, surprising because one of the things that marked this year was the completion of the new Outpatient department. Considering that we had to work in a more squeezed space for about 10 months, we are very proud of the results obtained. With the inauguration of the new clinic, the emergency service was reorganized and we saw an increase in daily attendance. All this has been possible thanks to the generosity of many simple people, who have put together the resources for the construction, and to many others who have continued to support the hospital for the costs of the wages, medicines and medical equipment. We were also visited by many volunteers who shared with us the joys and concerns of our people. Without the help of these committed volunteers, many of the activities would not have been possible. Thanks to the solidarity of many, the hospital is able to reach the most distant and that’s why people trust us. Looking back, there are also shadows, frustrations and disagreements that happen when there is uncertainty for the future and concern to use the limited resources efficiently. I think that what remains is to see the collective commitment, especially of the local staff, together with the help of many brothers and sisters who care about the life of the people of Mapuordit and South Sudan. What remains is the testimony (shown to me by many people this year) of those who accept the difficult privilege of caring for others, those in need, those who are vulnerable and yet, are the face of Emmanuel: God, with us. I return to the sentence by Pope Francis, I opened this letter with. For this Christmas I wish you, as I wish to myself, to look back and discover, in our lives, certainly the thorns and perhaps the weeds, but also the hope that there is room for Life; that Life, of which God has great care, is not annihilated by the sad facts that happen in the world. What we see and what worries us is only part of reality. Sometimes, we see sad events which paralyze and frighten us. We think that we are alone, and that we will not manage. Yet Christmas is an opportunity for God to tell us that we are not alone. It is his chance to enter into our life to tell us that He is with us, to remind us that He is looking for a place, right there, in our heart, with the trust of a child. I send you a warm greeting and a hug. I entrust the Peace of Southern Sudan to your prayer, as I entrust myself too. Blessed Christmas and Amazing New Year 2018!